In the world of natural wine making, discovery, the quest for something new, is the constant theme that comes up in conversations with winemakers. Ryan Stirm is no exception. “Exploratory, peeling back the layers” was his response to my question about how to describe his winemaking style. He came here from Santa Barbara because he was attracted to the wealth of old, abandoned vineyards he could restore in Santa Cruz. He now leases and farms 8 acres of mountain vineyards, planted with Pinot Noir, Chardonnay, and a little Cabernet Sauvignon, all dry farmed and organic. But alas his first love is Riesling which he must source from Cienega Valley and Santa Barbara since there is little of it in Santa Cruz. “I believe hot climate Riesling has a future”, he said, the first of many heresies spoken here. He makes multiple dry and off-dry Rieslings from several vineyards, multiple picks, and an array of vinification strategies. It’s in the winery where things get interesting. 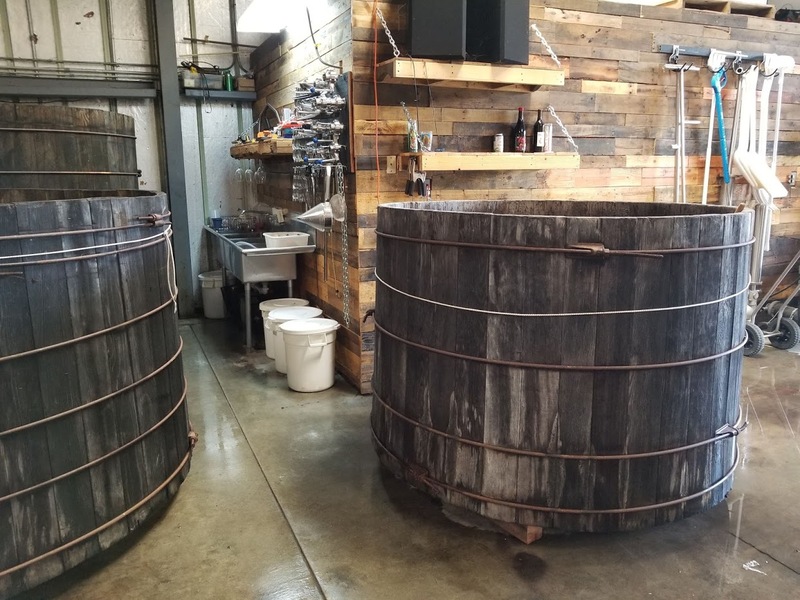 Some of the wines are fermented in old, redwood barrels from the 1960’s; others in modern, stainless steel tanks with glycol chillers. Some of his whites are on the skins for 24 hrs. to get lots of extraction, pulling out some of the bitter compounds that most winemakers avoid in white wine. Sometimes he will ferment warm to blow off excessive fruit aromas and allows some purposeful oxidation early which he claims softens the bitterness, and then sends the wine through full malolactic fermentation. All of this is heresy among conventional makers of Riesling. Add to that the signature of natural wine—native yeasts, no filtering, and sometimes a bit of sulfur at bottling–and you have a master class in how to play with wine. It should be said there is some theoretical support for early oxidation. When Burgundy was grappling with their premature oxidation crisis a few years back, one theory about its cause was that the grapes were not exposed to sufficient oxygen when they were pressed, which according to the theory protects the wine from oxidation as it ages in the bottle and makes it more stable. But enough theory. The results of this experimentation are wines of stunning intensity and energy. I could have picked any of his line up of distinctive Rieslings to review but this one stood out. Gold color reflects that early oxidation. The intense, focused nose is packed with scents of ripe peach, honey,red apple, haloed with the smell of fresh air after a rainstorm—enticing and nuanced. There’s a bit of petrol, but at this point it’s still a background note. And despite the use of oxidation there is no hint of oxidative aromas. 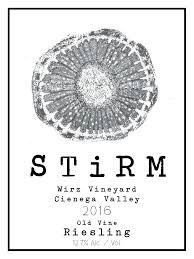 A dry Riesling, iIn the mouth it’s round and full with a bit of weight up front, but surges quickly through an expansive, prickly midpalate, and a mouthwatering, tart, hi toned finish. After that initial burst of fruit, it settles into complex textural layers—piercing and dynamic, steely with finely etched fruit in the midsection, and some tannic grip at the foundation all held in glorious tension. Ample dynamic range for this wine from round and fruity to cutting and thrusting with relentless intensity pulsating through a crystalline finish. Brash, confrontational, a bit schizo from friendly to fierce in an instant, like Pat Benatar’s Heartbreaker.